Working a 9 to 5 job, over an hour from home, means that most days I eat breakfast and lunch on-the-go. The fact that I "brown bag" two meals a day can sometimes be a challenge for my healthy eating goals, but fortunately I've come up with a few ideas to keep things interesting. One of my favorite grab-&-go lunches is fresh veggies and homemade hummus. Unlike traditional hummus which uses tahini to make it creamy I use Greek yogurt. Not only does the yogurt give it a nice texture it also provides extra protein and a tangy taste. Just as important as the food I'm eating is the way I pack it for transport. Using a wide mouth Ball Canning jar, makes this a fun to eat and easy to transport lunch. Ball brand jars has been providing quality preserving products since 1884 and is a reliable company like Stonyfield Yogurt; one whose products you can feel comfortable about. Add all ingredients to a food processor and blend until smooth, add more yogurt or water until you reach desired consistency. Taste, for seasoning. Best serve chilled or at room temperature. Place desired amount into a wide mouth Ball brand jar and top with carrots and celery or your favorite vegetable. What a great idea to put the hummus and veggies in the jar! It's so convenient when you are on the go! I will definitely try it! Great idea! We are renovating our house right now and I just don't have time to prepare food. This will make a great snack. Excellent suggestion for a packed lunch or snack for work and i love the addition of yogurt to the hummus. I really really hate washing out tupperware containers, it is so much nicer to use glass. I've never tried making hummus wth yogurt but it sounds great! This is brilliant for a snack in the car! Great for road trips too. Great idea combining the yogurt and hummus. I'm going to have to try this! Oh how I love hummus and this is a great on the go idea! Thanks for sharing!! I love hummus and greek yogurt, so this is a winning combination for me. Healthy as well. I work out of the house too and my breakfast and lunch are normally at the office which, you're right, makes it hard to eat good. MMMm the Greek Yogurt Hummus looks good! We love hummus. I never thought to add yogurt, I want to give it a try. Very cute and practical idea! Very practical packaging to take on the road. I like the idea of adding yogurt to hummus. Such a fun idea. I love how practical mason jars are. This looks like such a quick, healthy snack! Perfect for workdays. What a clever idea to use yogurt. I need to try it! This would be a cool idea to do for a backyard party, too! Love it! I love me my hummus but I've never added yogurt to it! What a terrific idea for a healthy snack. I always have hummus on hand to snack on. This is a really fun idea!! Using a canning jar for packing this for on-the-go is such a great idea! Nothing better than hummus on the go. I love canning jars. I think I have over 300. I use them for everything. What a fun, delicious snack! I love hummus. This is brilliant!! 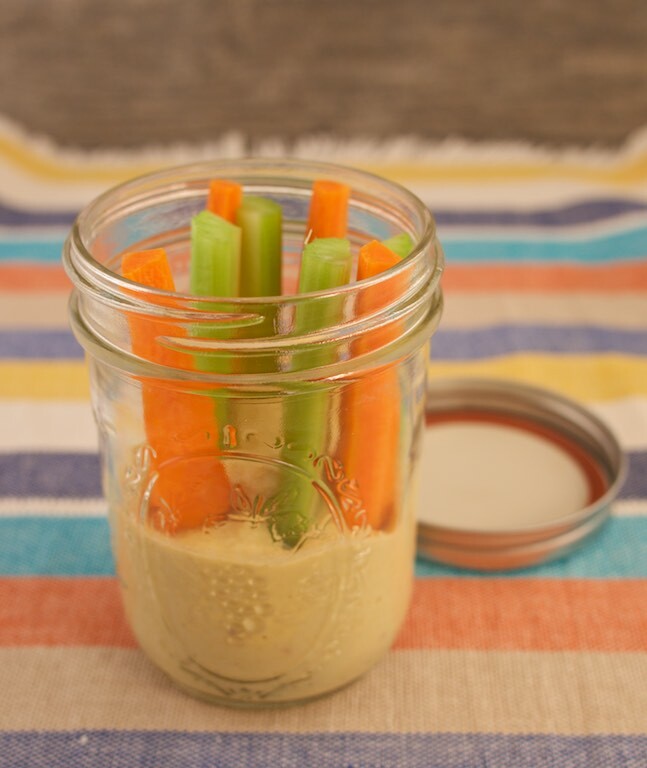 Love hummus and LOVE how you made it on the go! I make our hummus also but never thought about using yogurt. I am really excited to try this recipe. Thanks! This is the perfect on the go snack! Lots of healthy crunchy dippers are the best! Brilliant, so love this idea! !